Military Motivational Speakers? Make a general laugh… or else! As I write this post, I’m sitting in United seat 7F on the way back from speaking for the Senior Acquisition Leaders event in Atlanta, Georgia. What can I say? Where to start? They flattered me with a standing ovation. Which, coming from these hardened career military folks was flattering. Apparently they thought it went well. And I’m glad. Very glad. But what really stood out for me was what a special time I had. I was absolutely thrilled to be part of the event. There is something special about working for the military. I’ve done it a few times before, and it is always special. And this speech and that crowd absolutely touched me. I love speaking to corporate groups… they are good people, hard workers, and I’m convinced that they really need a message of lightness and fun. But working for the military is a whole different beast because they are passionate about their jobs. Passionate. They have a call to serve, and their amazing attitudes are infectious. 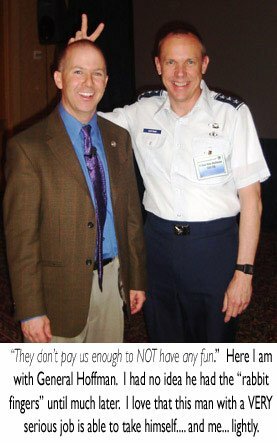 before my program that, “They don’t pay us for us not to have a good time.” General Hoffman is a fun, upbeat leader who strongly believes that we need to take ourselves less seriously — especially perhaps those people in such serious jobs as the Air Force. “Don’t get me wrong,” General Hoffman continued, “This is a serious job. We make planes, drop bombs and kill people. We’re not all fun and games. And we’re not in this to make people laugh.” But he went on to say that if you are that stereo-typical all-serious military guy you burn out, your people burn out, and you never get the results you are after. I loved how he made the distinction between having a sense of humor and being funny. I totally agree: you don’t have to make jokes and tease people in order to lighten the workplace. Humor in the workplace doesn’t always mean (and sometimes should NOT mean) laughing or making others laugh. But it always means being about to take yourself a bit lesseriously. It means having and using a sense of humor yourself. Wow. Humor in the military? Humor in leadership? Humor during a time of war? You bet, if you believe this general. And the most wonderful thing is that his attitude and leadership strategy is obviously working — just look at the three stars on his shoulder. General Hoffman… it was an honor to speak to your group. Thank so much for including me. https://www.bradmontgomery.com/wp-content/uploads/2018/11/logo-1-495x198-1-300x120.png 0 0 admin https://www.bradmontgomery.com/wp-content/uploads/2018/11/logo-1-495x198-1-300x120.png admin2007-04-09 10:30:482007-04-09 10:30:48Military Motivational Speakers? Make a general laugh... or else! Behind the Scenes of a Motivational Speech?